Join us for a fun and free preview event to get know more about the artwork, the artists and the process. Check out and bid on some on some of the great silent auctions goods such as dinners in local restaurants, adventure trips, hotel stays, artwork, clothes and other great items. Immediately after the open house finishes, the children’s circus parade will take San Pancho’s main street, all the way from entreamigos to the Malecon. All guests on Friday night are invited to join our town’s delightful Art Walk which will be showcasing some of the art pieces on the streets of San Pancho. Our benefit Gala will be full of surprises, fun and spectacular art pieces. Spectacular items will be auctioned through the night; and we will have the privilege of enjoying an amazing live performance of the Bahia de Banderas Orchestra, one of the finest orchestras in the region with more than 20 extraordinary musicians. Be ready for a magnificent party! 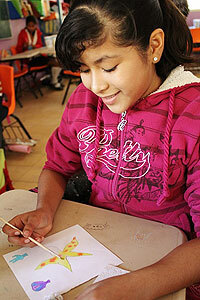 Meanwhile, artists and children are learning and having fun together, while they create some breathtaking art pieces! Everyone is participating: 33 children from Las Lomas Elementary school, 80 youth from San Pancho Junior High and more than a 100 kids from our local primary school, have joined the art workshops, starting their mornings with lots of energy and inspiration. Their spectacular creations will be displayed on our festival. Join us in this delightful celebration of life! Recently we asked some of our staff artists to write up a little about themselves… Lola works in the recycling workshop at entreamigos, and among many other things she creates art with recycled objects and will have a piece in our auction. I, Maria Dolores Silva Castellanos, was born on September 15th in Tuxpan, Jalisco. My parents are J. Guadalupe Silva Talamantes and Lucina Castellanos Bonilla, I am alive because of them. I came to the world with many skills, thank god I know a bit of everything, I thank god beacause in this world I am creative. Here at entreamigos we are recyclers. We know how to re-use and create stuff with what we recycle. 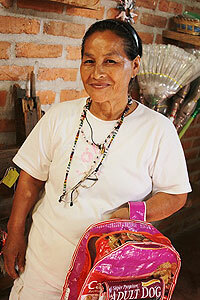 But the most important part is that we find a real sense for a world: San Pancho Nayarit. In entreamigos we have communication, education, a library, computers, language center, recycling, sowing workshop and we work with glass, plastic and carton, what everybody throws away we transform it here, with our craftsmanship. But the most important thing for me is to have my friends. 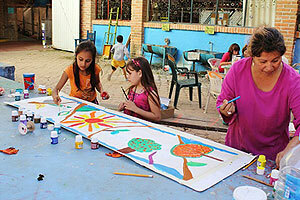 In entreamigos we find a true meaning in enjoying, creating, appreciating and loving ourselves. Come enjoy life here at entreamigos, creating and recycling.